No Camping Experience? No Problem. Join us on a family campout to learn the ropes of camping and experience all the fun of being in the outdoors! Registration is $90 for a family of up to 4. Additional family members $5 each. One family per registration. For families greater than 4 — special arrangements are needed — please email [email protected]. Sorry, children 5 years and younger and pets cannot attend this program. 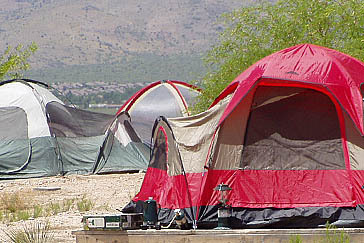 Since this event focuses on learning to tent camp, RVs are not allowed. If a session is listed as full, you may be added to the waitlist by emailing [email protected]. Families should bring food, sleeping bags or any bedding, pillows, camping chairs, clothing, sturdy shoes and personal items including toothpaste, towels, soap, etc. The program will provide tents, sleeping mats, flashlights, chairs and all activity equipment. Beverages provided include water, coffee, tea, and sports drinks. Provided snacks include seasonal fruit, granola bars and more. Families are responsible for bringing two lunches, dinner and breakfast. Activities vary depending on the park, participant ages and weather conditions: Guided Hikes • Mountain Bike Clinic • Archery • Geocaching • Fishing Clinic • Live Animal Demonstrations • Campfire Stories • Presentations on Geography, Birding, Geology, Astronomy • Service Project. Plus: Water, coffee, daily snacks, Dutch Oven dessert for dinner, and campfire treats! You will need to provide four meals for your family during your Family Campout weekend – lunch and dinner for Saturday and breakfast and lunch on Sunday. 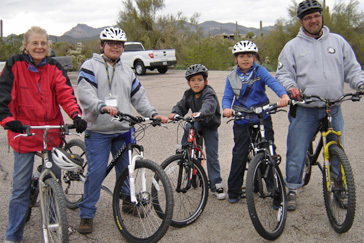 Arizona State Parks Family Campout Program will provide propane stoves for cooking as well as healthy snacks and a few essentials listed below. You should bring whatever pots, pans, and cooking utensils you will need to prepare your meals. Also, please bring eating utensils (forks, knives, spoons) for each member of your family. Your everyday home utensils are a fine option. We will supply plates, bowls, and cups for your family. Be sure to include additional items as necessary for anyone in your family with special dietary concerns. If you need to cancel your reservation more than 7 days before your scheduled event date, you can receive a refund minus a $5 non-refundable reservation fee. No refunds will be given for cancellations less than 7 days before the campout. Please email [email protected] to cancel.